Larger uploads: You can upload videos up to 2GB and documents up to 500MB. Better SSL Security – We have improved our SSL configuration for improved security, just remember to visit https://spokt.com for the most secure connection. We’ve made about 10 other small tweaks, bug fixes and enhancements. We hope you have a wonderful 2017! 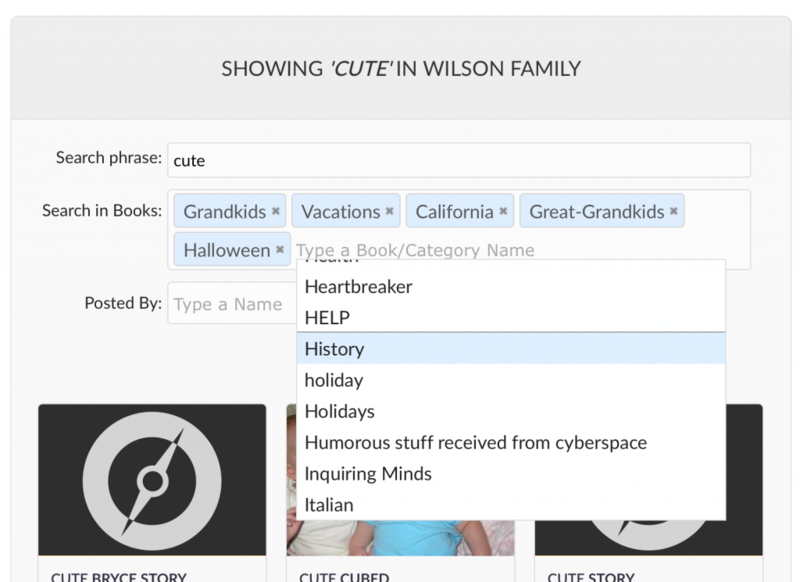 We deployed three new features this weekend and we’re excited to share them with you. We’re focused on continually making Spokt better for you! Hub Avatars – Hub Avatars make it easier than ever to know which Hub you are currently using. Hub avatars also give admins a chance to personalize the group’s identity. Advanced Search – We’ve made Spokt’s powerful search even better with advanced options to refine your searches. Can’t find that photo that Julia posted? 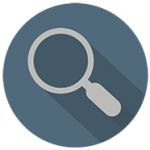 Advanced search is here to help! Search in Books and by User. Featured Photo – In addition to the much loved Remember This? 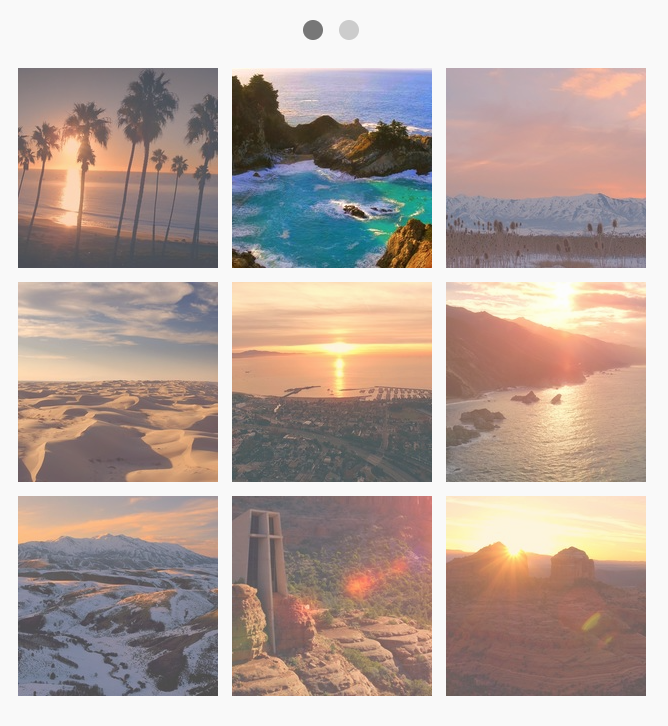 feature, pin a newly uploaded photo, or pull out an oldie from the archives and help everyone reminisce a little more. 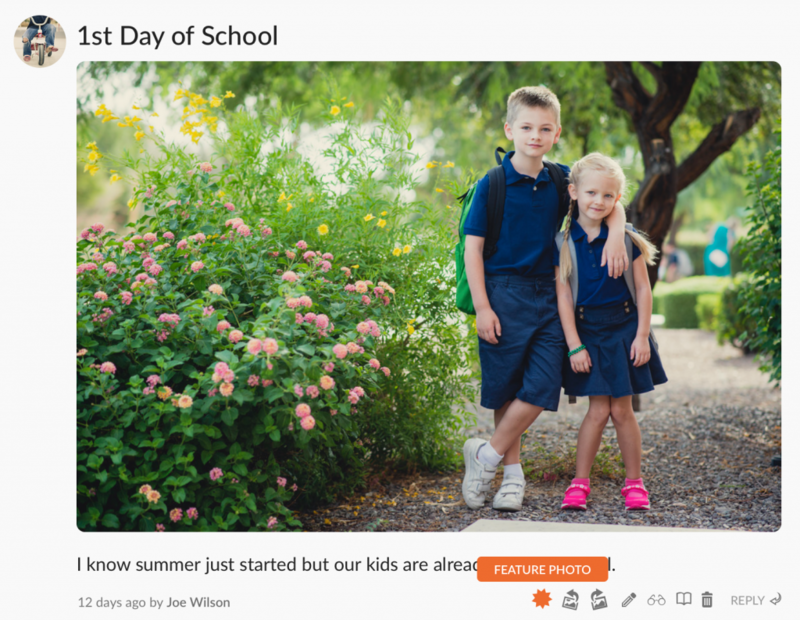 Feature a favorite photo on the Hub Home! Pokémon GO is a new mobile game. You have probably heard of it. It has had phenomenal success. Satoshi Tajiri created the original Pokémon game in 1995. Bug collecting was the inspiration. Players collect the Pokémon, and train them by battling other Pokémon. (Pokémon is short for “Pocket Monsters”). The premise of Pokémon GO of the game is no different: Gotta catch ’em all. What is new is how players perform the collecting and battling. In Pokémon GO players need to get outside, move around, and go to new places. The game map is a map of the real world. As you move through the real world you move through the game world. There are 3 big reasons to get outside and move. First to catch Pokémon, second for Pokéstops, and third for Gym battles. 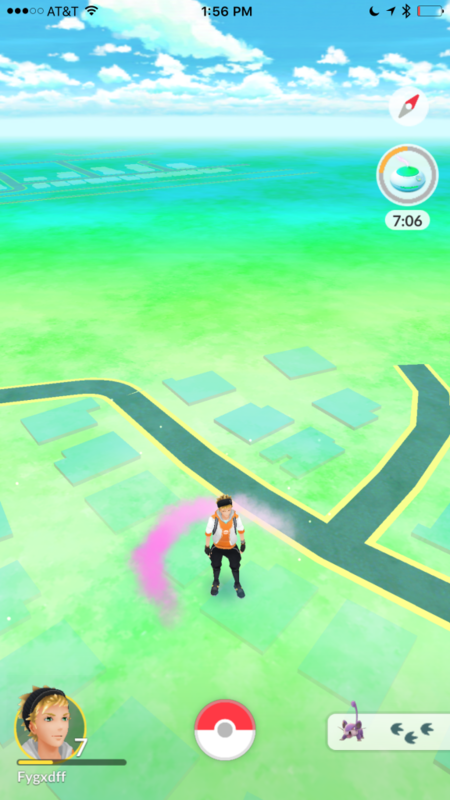 The game gives you information about what types of Pokémon are nearby. As you move around you get closer or farther away from them. Once you get close enough you can battle one and catch it. The second reason to get outside is for Pokéstops. These show up on the map as blue cube shaped beacons. You travel to a Pokéstop and it rewards you with in-game loot. Things like Pokéballs (monster traps), eggs, and incense (to attract Pokémon to you). The third major game element on the map is Pokémon Gyms. The Gyms look like floating pedestals. Players go there to battle the Pokémon left there by other players. To battle at a Pokémon Gym you must reach Level 5. When you reach Level 5 you can join one of three Pokémon teams. If a you win the Gym battle your team now controls the Gym. Other players in your team can contribute their Pokémon to defend the Gym. Watching and helping my kids play Pokémon GO has been pretty fun. The summer release of Pokémon GO has been great for most of the country. Families are going on walks together, running into other families. Here in Arizona we can’t wait for winter to play for longer than 3 minutes without sweating. Togethera recently announced that they will be shutting down their service on August 4th. Togethera started almost 3 years ago and is loved by its users. It is always disruptive when a service you use shuts down but Togethera is trying to make the transition as smooth as possible. Togethera will create export files to it’s users that will contain photos and data files containing comments. 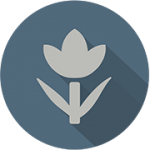 We intend to build an import tool that will allow Togethera “refugees” to build a new home on Spokt. The tool will import photos AND the comments. We will also offer a special price of $29 for the first year to further ease the transition. This is a price per group: one person pays and all members share the enjoyment. Our import tool will be ready on or around the Togethera shutdown date. Check this blog for more updates! Two years ago MyFamily.com shutdown and we helped people migrate several million records to Spokt. We can do this for you as well. 2015 was full of changes for Spokt. As we’ve grown, we have added several new features throughout the year to make Spokt more enjoyable for you. Here’s a summary of enhancements and features from this year. For Hub Admins, you can now view your member lists in order of first name, last name, or date joined. We realized that sometimes, you might accidentally upload the wrong photo, or find a larger one after you post, so we made changes so you can replace photos without having to delete the post. Simply click “Edit” on the particular post, and select “Choose File” next to the words, Replace Photo. Don’t forget to save your changes! With the release of the iPhone 6 and 6 Plus, we updated our mobile site to fit the larger screen sizes. We also implemented landscape view, and added the ability to edit posts and replies on your phone. While Books itself was released in December of 2014, we made improvements to it throughout 2015. You can now view Books as a list, or in alphabetical order. If you want to see how books work please watch this screencast. Calendar was released on April 1, 2015, no joke. You and your Hub can keep organized together, plan events, and celebrate a number of occasions like birthdays and anniversaries. It is a great tool to help members continue to connect with each other. You can also print your calendar. For general calendar information, you can watch a screencast, or check out this post. In August, we made some changes to Videos. You can now upload videos from your smartphone, and you can use the new embed codes from YouTube and Vimeo. We released Harbor on October 18, 2015. Harbor is our backup tool, so you can have peace of mind, knowing that your data will always be safe. We offer Harbor backups a la carte for $49, or as part of our Extended or Premium Hubs, compare these new plans here. We are excited for 2016 and what it will bring, and glad you are along for the ride! We love gadgets around here, so of course we ordered the new Apple TV last week. We have been having a (mostly) great time as we’re becoming familiar with the 4th iteration of Apple’s streaming set-top box. If you have a television set and are into online streaming content as much as we are, then that alone makes Apple TV pretty much a no-brainer. For example, my Vizio 4k “Smart” TV offers pretty much the same apps that the Apple TV offers, with two major differences: First, where the interface and navigation vary from app to app on the Vizio (making it difficult to jump between services), the Apple TV unifies video control across all video apps. It’s nice to jump from Netflix to the TED app while maintaining a seamless navigation experience when scrubbing, pausing, and even turning subtitles on and off. It’s dead easy, and it makes online watching the simplest I’ve ever seen (by a landslide). One of the first (and thankfully only) problems that will likely cause you consternation when you first power on the Apple TV is text input. While you can quickly get accustomed to inputting characters for logins, passwords, and searches, one is struck with initial feelings of frustration due to the lack of soft keyboard (from your iPhone) or the ability to connect a bluetooth keyboard. The silver lining is that Apple has built in some great ways to shortcut the process of text input. We’re certain Apple will offer more options in the coming months, but you’ll feel much more comfortable once you learn a few basic tricks, even without a proper qwerty keyboard. There is a “Case & Symbol” selector tool at the bottom of every input screen where you can choose between uppercase, lowercase, and symbols. (There is also a “RECENT” shortcut in some cases which we’ll cover next). You will immediately notice that alternating between upper and lower case is a bit of a drag. That’s where the two hidden alt-caps tricks come in. Simply PRESS THE PLAY/PAUSE BUTTON to switch between uppercase and lowercase alphabets. Alternatively, you can click + hold on any letter for about one second and you’ll see an option appear to choose the opposite case, as well as alternate characters if they exist for that letter (think ñ or ü). Click on your desired character and continue on with your text entry. These actually end up being fairly effective time-savers since you won’t be traversing the three rows of the standard “keyboard” (saving two trips to capitalize and de-capitalize for a single uppercase letter, for instance). Another great time-saver is the “Recent” option. If you’re logging in, you can choose from recent email addresses or login IDs that you have previously used. This step will cut your typing time in half. Again. 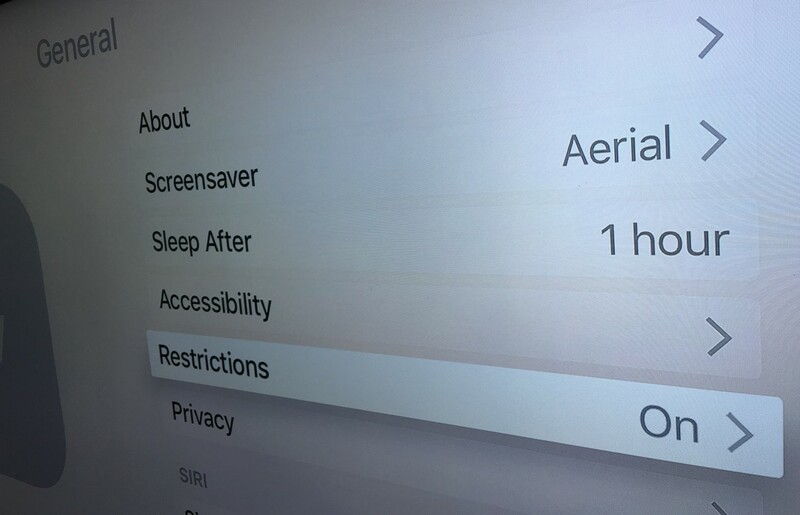 The second thing that worried me when I fired up the Apple TV was feeling torn between entering my strong password every time I purchase content or turning off the password requirement entirely, an option that is far from ideal when young children are also using the Apple TV. However, I have since discovered this was a non-issue. Apple offers a good balance between keeping your strong passwords AND keeping the surprise iTunes bills at a minimum when others are using the device by allowing you to set a 4-digit passcode. To enable the passcode prompt for purchases, simply navigate to the General -> Restrictions in the Settings app and set your passcode. From there, you can also decide whether to allow or block Purchases and Rentals on the iTunes store, and block In-App Purchases entirely if you prefer. Be sure to set Accounts -> iTunes and App Store -> Password Settings -> Require Password to “Never” in the Settings app and set “Require Password” to “No” under FREE DOWNLOADS if you are comfortable relying only on the 4-digit passcode to verify purchases. Now that you’re all set up and a pro at adding content, it’s time to play. Here are a few apps we recommend to get you started. 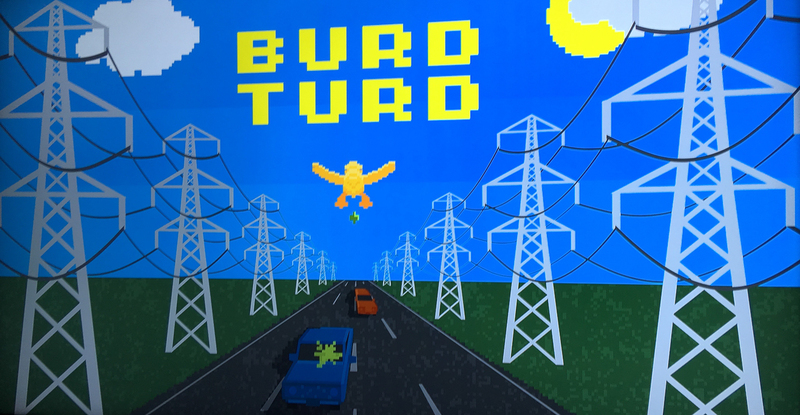 1) Burd Turd – Our friends over at Uhhhmagine Games have created a silly but surprisingly challenging (and addictive) game called Burd Turd. The game revolves around a mother duck named Gertrude who has unwittingly flown onto a busy highway, with her baby ducklings following behind her on the ground below. We can’t say for sure why the angry drivers are trying to smash the baby ducklings, but it’s your job to steer Gertrude over the cars to drop “turds bombs” on them, thus forcing them off the road and thereby saving the helpless ducklings. You gotta be quick and nimble, avoiding the power lines which when touched will turn Gertrude into a cooked goose. It’s a fun arcade-style game that has entertained children and adults alike at our home. Also, it looks like they’re giving away some free downloads to early birds, so hit them up at their twitter page while they’re available! 2) Crossy Road – An all around entertaining game where you cross a series of busy roads, rivers, and train tracks. I haven’t gotten very far. It’s well designed and friendly. It’s also fairly challenging, but fun. 3) Alto’s Adventure – The real selling point of this game is its beauty. It’s almost like a serenely beautiful interactive screen saver. You guide a llama rancher-turned-snowboarder down an endless series of mountains, avoiding the occasional obstacle and mastering tricks. Don’t let that fool you though, this is less about snowboarding or llamas as it is about tranquil but challenging gaming with plenty of eye candy stemming from the day/night fluctuations. 4) Pako & Asphalt8 – If you enjoy car games, these are fun options, each in their own way. Both are 3D games, though Pako is more simple in its approach, whereas Asphalt8 is closer to what you’d expect a fully decked out 3D game to look like on a proper gaming platform such as the PS4. They’re both fun and challenging, and give plenty of variety to keep you busy for hours. Both are good options if you find you’re needing to step away from the hustle & bustle for a bit. And last but not least, we have to mention the mainstays of the Apple TV: Netflix, a very nice Vimeo app, and our favorite, the TED app featuring thousands of inspirational and entertaining TED talks. Did you splurge on the new Apple TV? Have you found any apps you’ve liked so far? We’d love to hear your experience and recommendations in the comments below. 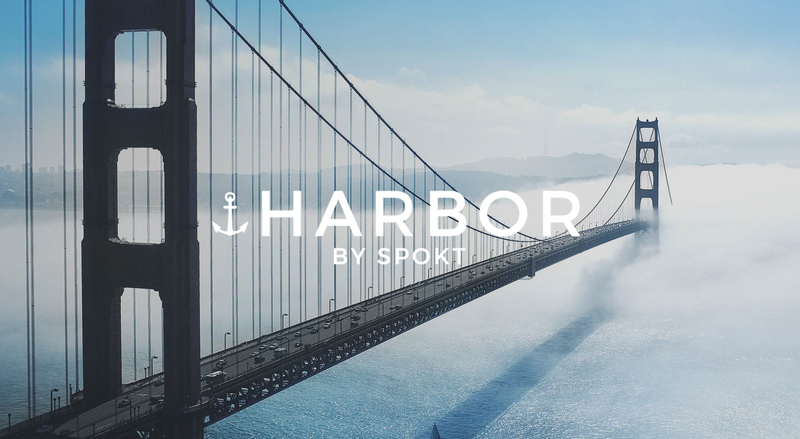 After 12 months of hard work, we are excited to announce our newest feature, Harbor. Harbor is our tool to help you back up your data from Spokt to your computer. We want you to have control over your data, and make sure you always have access to it. We want you to always be able to access all the memories you have saved on Spokt. There are two ways to use Harbor. It is included in our Extended & Premium Plans, or you can order an A La Carte Harbor backups on demand. In our Extended Plan, Harbor backups are semi-annual, and in our Premium Plan, you get monthly backups. Either way, Harbor gives you that little extra bit of peace knowing your data isn’t just safe — it’s yours. Did you know that you can save up to $30 on a new Hub this fall? We have made some exciting changes to Spokt, and want you to get the most out of them. A few weeks ago, we introduced our all new Hub plans: Family, Extended, and Premium. Our Family plan is perfect for families, as you might have guessed. You can have up to 75 members, with 15GB of storage. This makes it the ideal plan for close families to keep in touch. Our Extended plan is for those with a slightly larger vision in mind. You can have up to 350 members, 30GB of storage, and you will receive Semi-Annual Harbor backups and the ability to point a custom domain name to your Hub. Finally, our Premium plan is the ultimate Hub, with unlimited Hub members, a whopping 60BG of storage, a custom domain name, and monthly Harbor Backups! Spokt has always been a great value, and this sale makes Spokt even sweeter. Our Family plan is $59/year, but if you create a new Hub by October 25, your first year will only be $44, which comes out to $3.67/month. Our Extended plan (a $149 value), is $89/year, but with our sale, your first year is only $69. If you choose our Premium plan (a $330 value), it is $119/year, but you can save $30 to pay only $89 on your first year! We are excited to start this new season of Spokt with you, and can’t wait for you to continue sharing life’s moments with those you love through Spokt. We are going to perform some routine maintenance for one of our database servers Wednesday at 2AM Eastern Time. The site will be down for 1-2 hours, after that Spokt will be back and healthier than ever! Update (3:40AM Eastern Time): Spokt is now back up. You will find that everything is peachy. 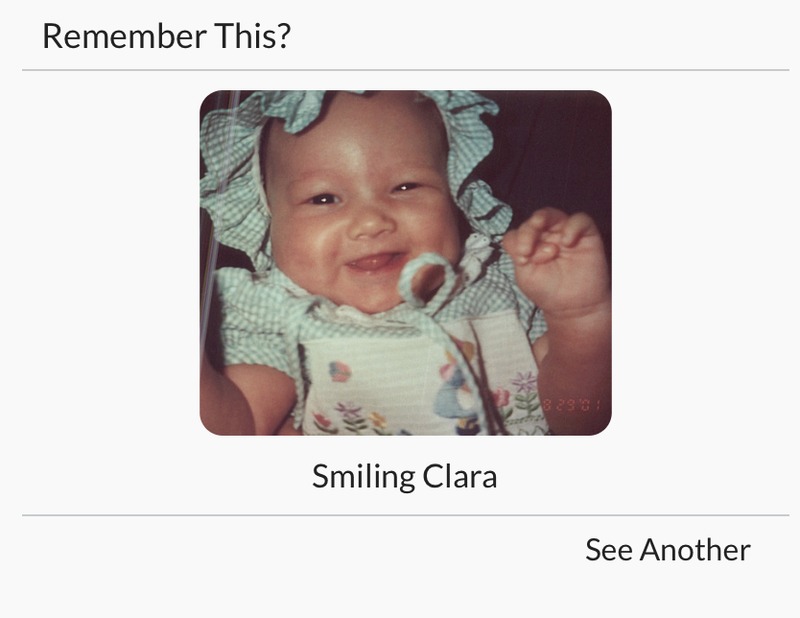 One of our most popular features among our users is the “Remember This?” feature. Once your Hub has been active for some time, the “Remember This?” feature will display one of your older photos at random. It’s like a blast from the past! Next time you see it, click “see another”, and a different photo will appear. 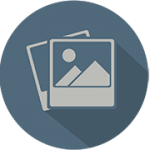 If you want to comment on the photo, or see other users’ comments, simply click on the photo. A fun aspect of this, is when you comment on a old gem, it will appear in your fellow Hub members’ Unviewed list and can spark new conversations! “Remember This?” is a fun way to see old memories, and share them with the ones you love.